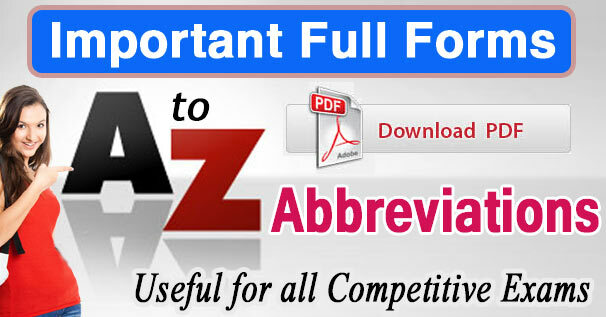 Important A to Z Abbreviations Full Forms for Competitive Exams– Learn the Important Abbreviations asked in competitive exam like IBPS, Banking, SSC, Railways. You will definitely get some help in your upcoming exams because there are lot of Important full forms are used in exams or useful full forms are will come in exams and surely will give you good marks may be you can use them for fun or entertainment purpose. Important Abbreviations for General Awareness section available in PDF. ICICI : Industrial Credit and Investment Corporation of India Ltd.